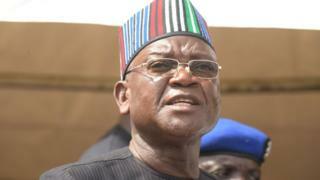 Di Independent National Electoral Commission don declare di govnorship candidate of di Peoples Democratic Party Samuel Ortom winner of di Benue state govnorship election wit. Prof Maimako Sebastian, Returning officer of Benue state na im declare am winner. Ortom wey be di current govnor of di state win im closest rival Emmanuel Jime from APC wit 434,473 votes, a combination of votes from both di govnorship election from March 9 plus di supplementary election of March 23. Im closest rival from di ruling All Progressives Congress, Emmanuel Jime score 345,155 votes. Meanwhile INEC don announce say dia officer for Gboko LGA, Prof. C.D Tulen wey jaguda pipo shoot as she dey go Makurdi wit di result sheet wey dem don collate already dey hospital dey receive treatment. INEC say dem don report di mata to authority and dem go closely monitor di investigation.